Valentine’s Day isn’t confined to Hallmark stores and flower shops. Traditional ideas espoused by Valentine’s Day manifest themselves in the comics world as well. The work of Charles Schulz, Jordan Crane, and Chester Brown are all prime examples. It’s important to start with Schulz. The cartoonist responsible for Peanuts also created the epitome of Valentine’s Day comics in a little book called Love is Walking Hand in Hand. 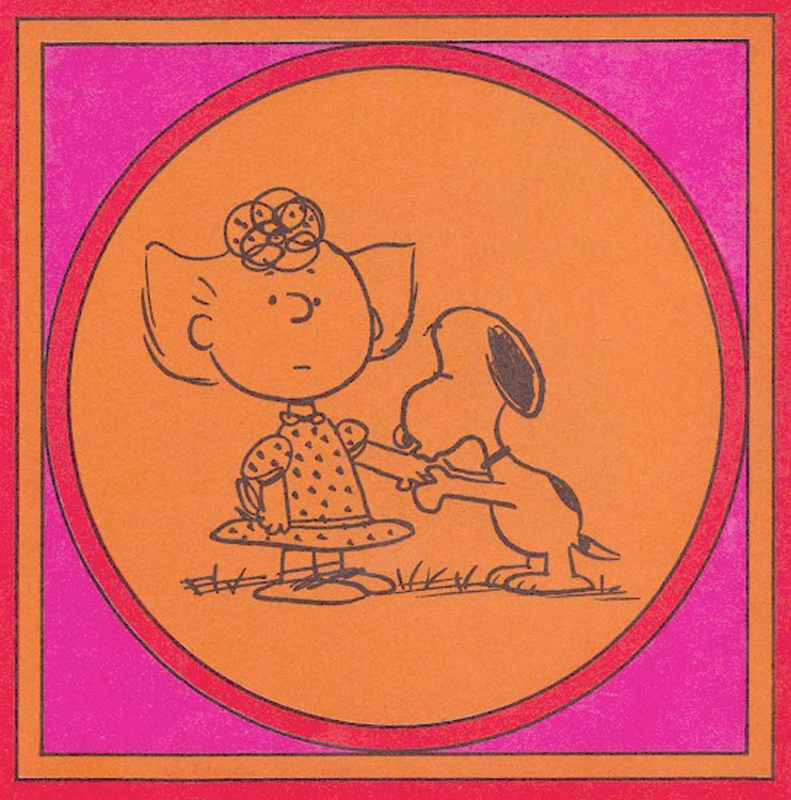 It was part of a series of Peanuts gift books that Hallmark released in the early ’60s. In creating this book, Schulz, the accidental king of all that is marketable, made the perfect comic for Valentine’s Day. Love is Walking Hand in Hand contains illustrated aphorisms that express the vibrance of love in the mundane. The book displays a bold usage of orange, red, black, and pink color palettes. Given its strong colors and visual simplicity, you could argue that this book would probably not do very well in today’s world of print comics and picture books. One might think that the color combination would put the reader on edge, forcing him or her to struggle without much visual breathing room. Nevertheless, by carefully balancing the colors and letting the black ink rest quietly among the buzzing pinks and oranges, Schulz created a warm and coherent space for the reader to inhabit. At its heart, Love is Walking Hand in Hand is a celebration of the little moments in which love reasserts its presence in our lives. The beautiful thing about this book is that Schulz preaches an all-encompassing notion of love. Love is when someone takes a moment out of his or her day to do something nice for someone else, but is best summed up by Schulz’s assertion, “Love is the whole world.” This seems like a perfect message to be sending on Valentine’s Day. One issue that Schulz’s book does not address is loss. Crane’s comic, The Last Lonely Saturday, explores the trials and release of life after loss. Crane’s story beautifully follows a husband’s weekly ritual to pay respect to his wife. In no more than a few pages, Crane retells the husband and wife’s entire history. From the comic’s meticulous book design, with its quaint size and the rounded, hand-lettered type in the first pages, readers can expect the story to be heart-warming. But Crane pulls at readers’ heartstrings with surprising grace. While the story is rooted in the traditional American cliché of lovers reunited in the afterlife, the story is told deftly. Without spoiling too much, Crane’s narration of the reunion of spirits is truly gripping. Similar to Love is Walking Hand in Hand, The Last Lonely Saturday is the kind of book that elicits an unparalleled visceral warmth, even after multiple readings. For those who may dismiss the works of Schulz and Crane for their seemingly cliché notions of love, there are other types of Valentine’s Day comics out there. 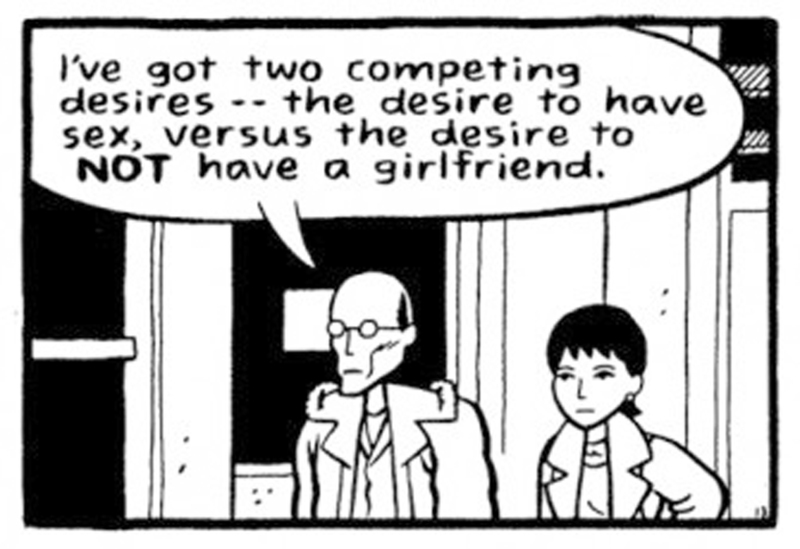 Brown’s Paying for It: A Comic-Strip Memoir About Being a John is perfect reading material for those disillusioned with romantic love and its inherent possessive monogamy. In this book, Brown sorts through all the legal, moral, and emotional arguments against prostitution in a sober and intense look from the perspectives of both prostitutes and their clients. The book begins with a record of Brown’s growing disillusionment with the concept of romantic love. Despite the documentary impulse that drives the detailing of Brown’s experiences, his real concerns lie beyond mere observation. He uses his own experiences in a boldly direct style to make the case for decriminalizing prostitution. In a conversation with another cartoonist depicted in the book, Brown reveals that he believes “the romantic ideal is actually evil.” At heart, it causes “more misery than happiness” and causes people to bind themselves to the wrong person for life simply to satisfy societal expectations. From Brown’s vantage point, the moral pillars upon which Valentine’s Day stands are inherently destructive and not worth indulging in if a society is to be deemed rational and understanding. With so many different perspectives on love, it’s hard to know which is the right one. Fortunately, there are plenty of cartoonists out there to aid in the exploration of the vast emotional territory of love, and there’s no better time to explore it than on Valentine’s Day.